When traveling, you generally know your destination by the time you get to the airport, but what if you purposely didn’t? What seems like a fundamental mistake could well become a fun-filled mystery. In 1996, I embarked on such a challenge when my best friend Jason and I showed up to LAX with our names on an airline ticket, a hotel booking and a car rental, all made with our consent … but not our full knowledge. Western Pacific Airlines sounds like one of those made-up carriers you see in movies, but it actually once existed, marketing itself as a low-cost and fun way to fly. WestPac made a big splash in the industry by renting out the entire exterior of its planes as flying billboards, usually for casinos and hotels, but most notably for the TV show The Simpsons. The Simpsons LogoJet allowed travelers to see the world from inside Homer’s head. Photo courtesy of Sunil Gupta / Wikimedia Commons. 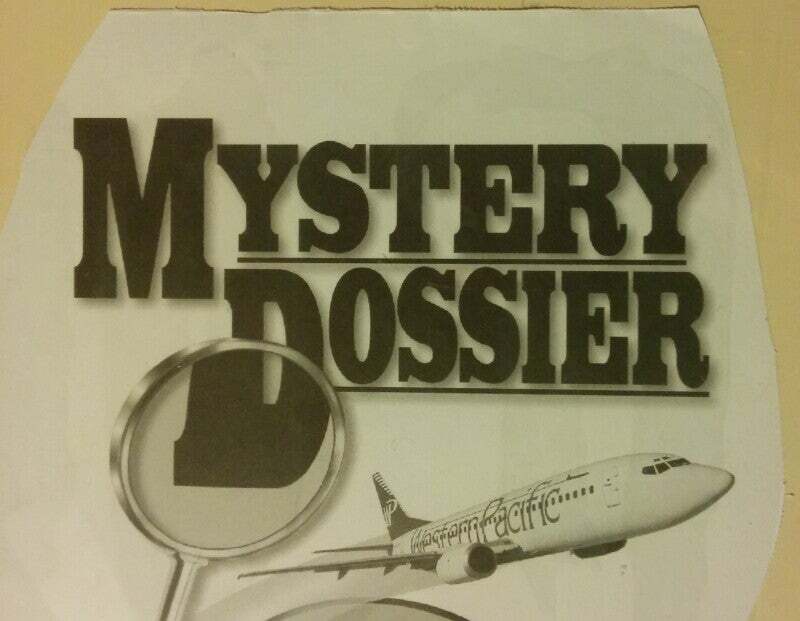 Another of WestPac’s innovations was Mystery Fares. The fares themselves weren’t a mystery ($69 round-trip from WestPac’s Colorado Springs hub, $99 from any other airport it served; another optional $100 for hotel and car) but the destinations were; until you checked in at the airport, you wouldn’t know which of 22 cities you would be visiting. To some folks this might have sounded like a nightmare, but to me this seemed extremely exciting. 1. We could end up having an amazing weekend in New York — airfare, hotel and rental car included — for less than $200! 2. Worst-case scenario, we could end up in Tulsa. Suitably informed of the odds, we paid our $199 and gleefully waited for fate to spin its wheel. On our day of departure, I was never more excited to fly — anywhere. Upon check-in at the airport, Jason and I were each handed Mystery Dossiers, envelopes labeled with our name that contained our tickets and paperwork. The time had come to receive our destination/destiny. Our mission, should we choose to accept it, was … Tulsa. With a mixture of laughter and groans, we high-fived and pledged to make the best of our worst-case scenario. 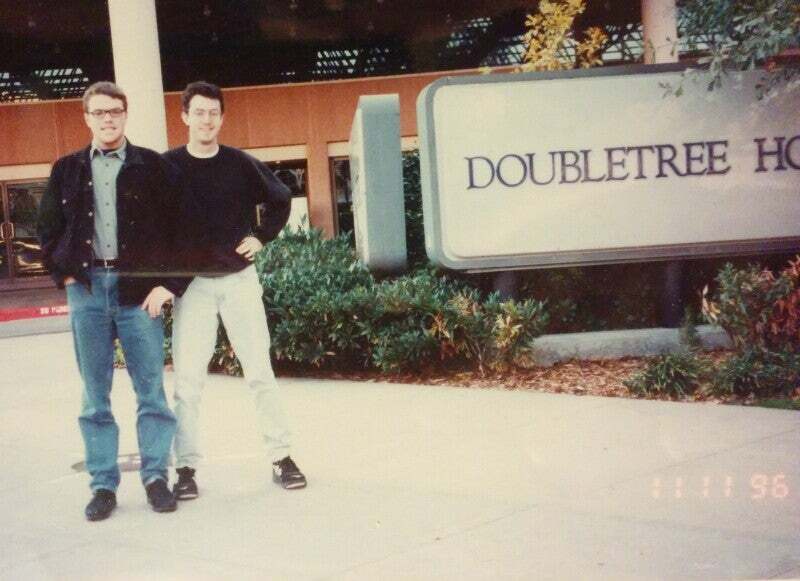 Just a couple of dudes hanging outside the DoubleTree in Tulsa. Three hours of low-budget flying later, Jason and I arrived in Oklahoma, picked up our Mystery rental car, and headed to our Mystery hotel, aka the DoubleTree Downtown Tulsa. We grabbed an alternative weekly newspaper and whatever maps we could find, and over warm cookies, we plotted our weekend. The writer having eaten all he could. We then proceeded to have a blast. 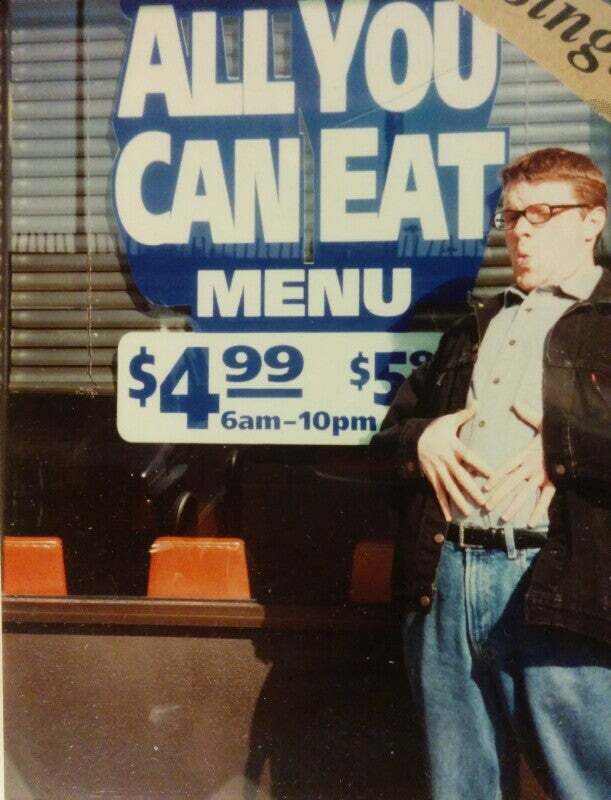 Turns out, Tulsa had blues bars, universities and even a Waffle House with an all-you-can-eat menu. You know: culture! Also, Oklahoma was (and I believe still is) located in America’s heartland, which afforded us an unexpected travel opportunity. I had long held the dream of visiting all fifty states and Tulsa was barely 100 miles from two I still needed in my collection. Even cooler, with two of Oklahoma’s tripoint borders nearby, we could visit four US states in the course of an hour. Be in three states at once! Photo courtesy of Wikimedia Commons. With stops at weird abandoned gas stations, photos at crazy church signs and unexpectedly delicious breakfasts, the weekend flew by and soon we were back at the airport for our flight home. Checking in at the counter, I found myself feeling a strange mix of emotions: grateful for good times with my friend, glad to be going home to my bed and yet oddly disappointed that I knew where I was headed. At the gate, I looked at the board behind the agent, held my hand up to cover the words “Los Angeles” and wondered what mysteries might lie ahead. Allowing for some mystery and adventure while traveling is awesome — and you don’t have to be an international spy to do it. Stripped down from all the hassles, flying is fun. Amid a hurricane of potential stresses and complaints, it’s great to remember that boarding an airplane at your home airport and getting off that same plane hundreds (or even thousands) of miles away is amazing. Tulsa ain’t so bad. Keep in mind that most places have fun things to do, once you give them half a chance. 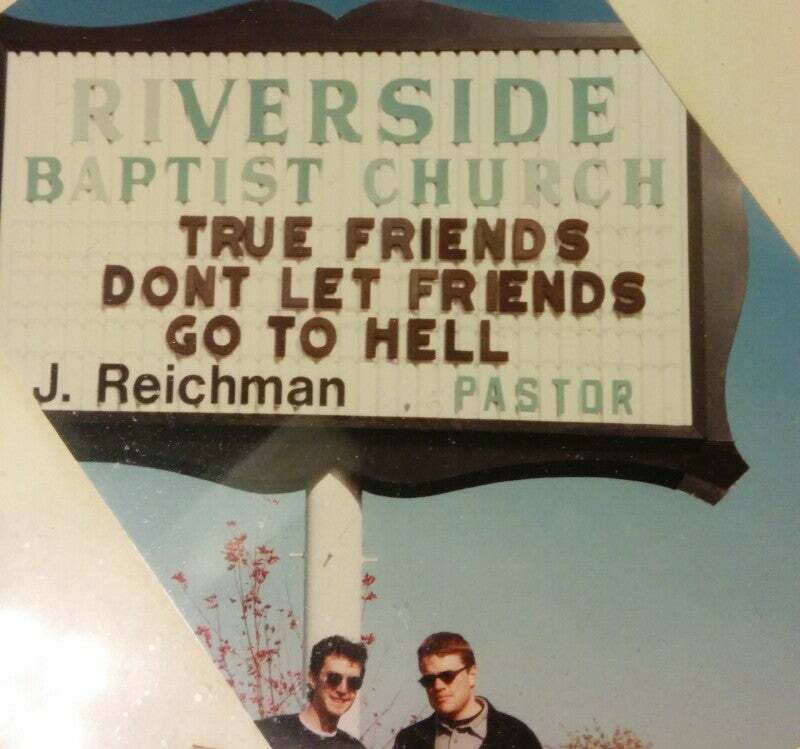 It’s been almost 20 years since I took this trip, and I’ve still yet to encounter a town that can’t keep me entertained for at least a weekend. Ever taken off on a trip without any idea where you were going? We’d love to know where you ended up, so please share in the comments below!